Once leeks are established, they seem to grow fairly fast. 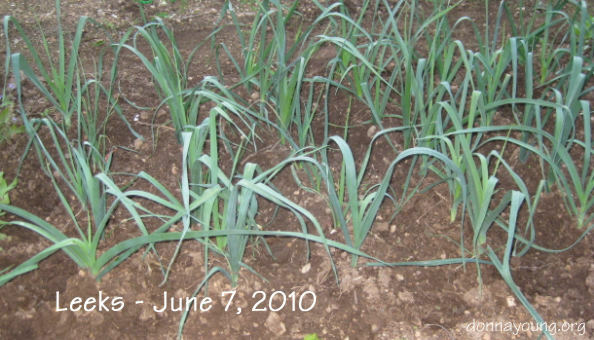 Below are two photographs of my leek bed. The first photograph was taken on May 14th and the second one was taken on June 7th. Piling more dirt around the leeks for the purpose of blanching them. Watering the leek bed during the time we had no rain. 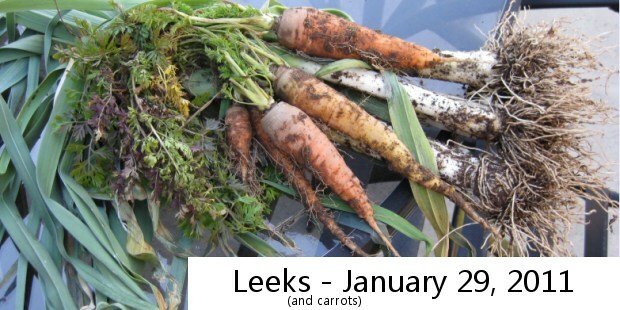 The organic matter that I placed around the leeks in April has since become mixed into the dirt around the leeks. I plan to add more organic matter on top of the soil surrounding the leeks very soon. The organic matter that I use comes from 1 and 2 year old compost piles that consist of leaves and grass clippings from our yard. That is all about leeks for now. The leeks grew well and by July they were getting close to picking size, not quite though. Unfortunately, one of the leeks sent up a flower stalk. That leek was the first one that I picked. In the case of leeks, once it starts putting energy into a bloom, the root quality goes down by degrees. By November, I had picked around half of the leeks. These leeks were just as good as store-bought leeks. I usually put the leeks in leek soup. As a first time leek grower, I was pleased to discover that cold weather does not kill leeks. For reference, I live in zone 7. However, I also discovered that a small animal burrowed in the thick mulch that was around the leeks and ate the remaining 5 leeks. When I pulled up the leaves, the white lower parts of the leeks were completely gone. My thoughts on growing leeks - not much trouble and worth it - espcially if you like how they taste and all of us here like them very much.